If you have never Grilled Salmon before, today is the day! 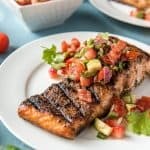 A simple rub and 10 minutes on the grill rewards you with perfectly cooked and flavorful salmon - and a fresh Strawberry Salsa is a refreshing way to top it off. In a small bowl, mix together brown sugar, cumin, parsley, salt, orange zest, garlic powder, paprika, and pepper. Drizzle the salmon with oil, then rub the pink side of each salmon filet with the seasoning mixture. Moisten a paper towel with cooking oil and rub it on the grill rack, lightly coating it. Preheat grill to 500 degrees F (or turn oven broiler on high). Place salmon on grill rack, skin side up. Grill, covered, (or broil 3-4 in. from heat) for 5 minutes. Gently flip and grill 4-6 minutes more, or until the fish just begins to flake easily with a fork. In a medium bowl, add the strawberries, tomatoes, jalapeno, avocado, onion and cilantro. Toss with lime zest, juice, and salt, adjusting the seasonings if needed. Cover and refrigerate for at least 30 minutes before serving over fish. Eat the rest with some cinnamon tortilla chips. Store any leftover salsa in an airtight container in the fridge for up to 3 days.